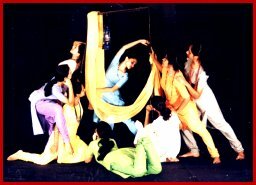 Established in 1983 by Sangeet Natak Akademi Award winner Late Dr.Manjusri Chaki Sircar, Dancers’ Guild has been a premier institute of contemporary dance Navanritya, a new approach to Indian dance, in a “chemical synthesis” of traditional Indian dance forms, yoga and martial arts. It is ‘open ended’ and ‘ever accommodative’ to new movements. “She said” is the last choreographic creation of co–director Ranjaboti Sircar and the group has decided to leave it as ‘unfinished’ with her sudden demise in 1999. It is an innovative approach towards exploring certain abstract images of the women’s world – its dream, desires, pains and passions. The piece performed by eight women dancers using the eloquence of silence, vocals and contemporary Bengali songs is a mosaic of multiple statements that finally merge to become one universal voice. Credits: Choreography: Ranjaboti Sircar. Songs: Chakravyuha, Voice: Ranjaboti Sircar, Sohini Das, Arunima Gupta, Debarati Sarkar, Sadhana Hazra, Sanghamitra Sengupta, Tanwi Mishra, Mou Sengupta. Performers: Jonaki Sarkar, Sohini Das, Arunima Gupta, Indrani Banerjee, Sanghamitra Sengupta, Sadhana Hazra, Koel Pal, Debasree Bose. Light Design: Kanishka Sen, Set and Prop design: Ranjaboti Sircar.